Walter R. Lupton, the son of Mr. and Mrs. Charles W. Lupton, was born in 1924 in Springfield Gardens, a middle-class neighbourhood in Queens, New York. He attended Andrew Jackson High School where he excelled in baseball as a catcher and basketball as a forward. Lupton played baseball in the Queens Alliance for Cambria Baseball Club and featured on numerous local basketball teams including the Springfield Gardens Squadron of the Sons of the Legion, the Springfield Rams and the Springfield Pioneers. Aged 18, Lupton entered military service with the Army on October 30, 1942, and promptly volunteered for the paratroopers. Assigned to the 508th Parachute Infantry Regiment, Private Lupton was stationed at Camp Mackall in North Carolina during the summer of 1943, where he played for the 508th Red Devils baseball team. The team, with minor league pitcher Lefty Brewer, dominating the opposition, had a 26–4 won-loss record that year, and clinched the Camp Mackall championship by defeating the 135th Quartermaster Company in the league playoffs. On December 20, 1943, the 508th PIR moved to Camp Shanks, New York, in preparation for overseas deployment. The men were given passes for two nights in New York over Christmas and were then loaded onto the USAT James Parker on December 27. They arrived in Belfast, Northern Ireland, on January 8, 1944, and camped in the small town of Port Stewart. The regiment was attached to the 82nd “All American” Airborne Division and participated in night training maneuvers while waiting for the inevitable invasion of mainland Europe. In March 1944, the 508th PIR left Northern Ireland for Scotland, then traveled by rail to Nottingham, England. On Sunday, May 28, 1944, the 508th Red Devils baseball team unexpectedly reformed for their final game before going into combat. Speculation still hangs over the reason this game was staged. The “official” story at the time was that the Nottingham Anglo-American Committee requested the Americans to stage a sporting event because the people of Nottingham had for years been void of entertainment. However, because the game was arranged by Brigadier General James M. “Jumpin’ Jim” Gavin, commander of the 82nd Airborne Division, many believe the game was designed to fool the Germans. If American paratroopers were playing baseball in England, how could an invasion be imminent? May 28, 1944, was a beautiful day and an enthusiastic crowd of 7,000 fans gathered beneath clear blue skies at Meadow Lane soccer ground to see the 508th Red Devils play the 505th PIR Panthers. A photograph of the Red Devils shows how unprepared they were for the game. Wearing jump boots, combat fatigues and vests, the ballplayers have an almost bewildered look on their faces as they pose for the camera, each man wearing a number pinned to his vest for easy identification when the photos were sent back to their hometown newspapers. Nevertheless, the game was a great success and the Red Devils outclassed the Panthers, 18–0. Just days later, Lupton, now a corporal, made his first combat jump into France on D-Day, June 6, 1944. Four of his teammates, including minor league pitcher Lefty Brewer lost their lives in Normandy. 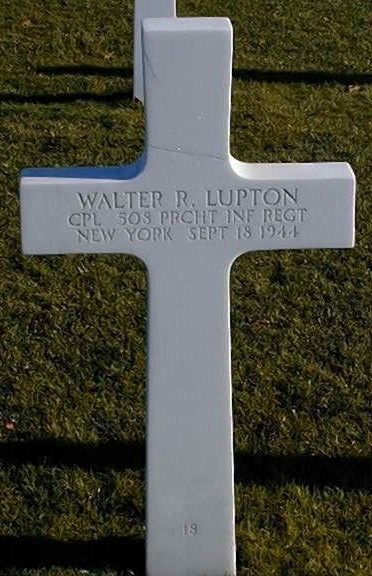 Lupton survived Normandy and made a further jump at Nijmegan, Holland (Operation Market Garden) on September 17, 1944. He was fatally wounded on September 18 at Wylerbaan Drop Zone and died later that day. Corporal Lupton, who is buried at the Margraten American Cemetery in Holland, was awarded the Bronze Star and Purple Heart.